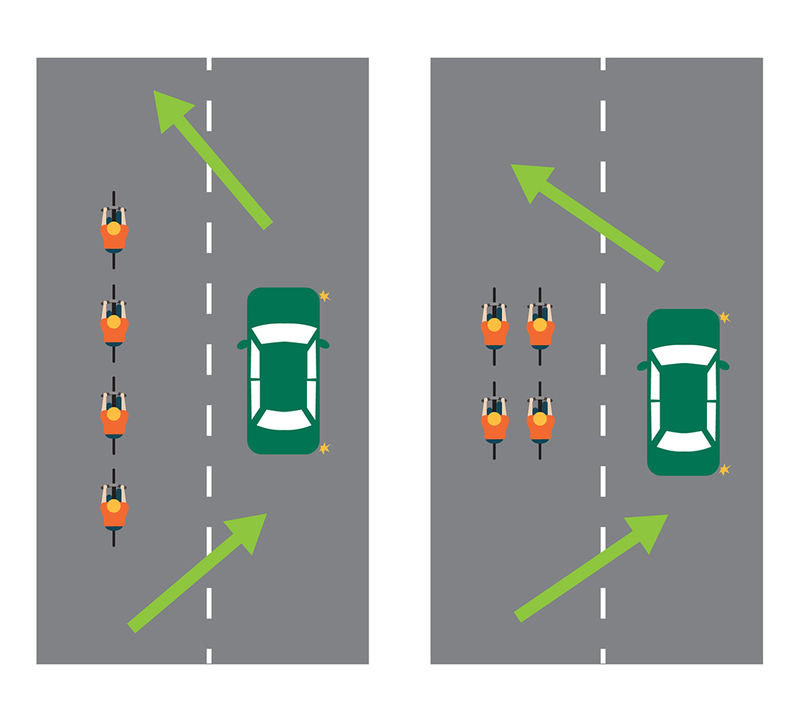 Cyclists often ride two abreast for a reason. It’s safer. It increases visibility and reduces the chances of being in an collision with a motor vehicle. Bicycle riders are one of the most vulnerable road users, and riding two abreast make them more visible. Two riders cycling side by side can be seen from much further away, than a single rider. Being able to see riders from a further distance will enable drivers to prepare to overtake the riders safely, in accordance with the Minimum Passing Distance law. 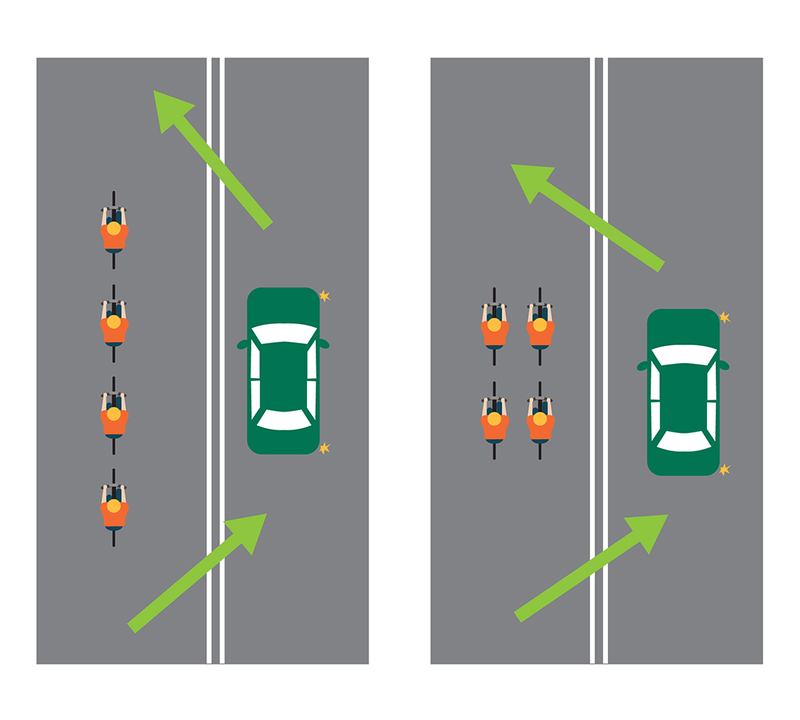 Riding two abreast also allows the motorist to overtake the group of riders more quickly as the line is only about half as long. This allows the vehicle to pass the group less time (giving for moving in and out to the correct location on the road). A good overtake is safer for everyone, the other vehicles on the road, the driver and their passengers and all the riders on the road in the group. Overtaking is legal, when safe to do so. What do cyclists need to know about riding two abreast? Cyclists must be within 1.5 metres of each other when riding two abreast. A third rider can overtake these two riders, but cannot continue to ride beside them. Riders should be courteous and consider other roads users around them. At times it may be safer and courteous to change back to single file in some circumstances. What do drivers need to know when overtaking cyclists riding two abreast? Only overtake when it is safe and legal to do so. We want all road users to get to their destinations safely. Drivers in NSW must provide a minimum of 1 metre when overtaking 1 bike rider or multiple. When the speed limit is 60km/h or under, drivers must provide 1 metre when overtaking - this is measured from the furthest point of vehicle (i.e. mirror) to the furthest point of the cyclists (i.e. handle bars, cyclists elbow). If the speed limit is over 60km/h, drivers must provide 1.5 metres of space when overtaking. Drivers are able to cross double lines and go on painted islands to provide bike riders with this distance, if it is safe to do so. A few seconds can save a life so please be patient. Our roads are shared spaces. Mutual respect and cooperation are the key to ensure everyone remains safe.